Sacred Basil, Holy Basil or Tulsi Basil is used widely in India as a medicinal plant, a culinary and religious herb. Said to be particularly effective in warding off mosquito’s Holy Basil (Tulsi) is fairly easy to grow from seeds and in warmer climates will last year round. Seeds are generally planted in spring once the soil begins to warm. Closely related to other basil species such as Ocimum basilicum. Holy Basil or Tulsi Basil is used as an insect repellent and also has significance in Hindu religion. Plants grown from seeds or seedlings available for sale online and planted in spring. Holy Basil or ‘Tulsi Basil’ tends to be a woodier plant than other basil species, and can in fact be grown from cuttings. Ocimum sanctum is the original species name however it is now called Ocimum tenuiflorum. The leaves of Holy Basil have more of a purple tinge to them with purple veins appearing as the plant matures. Plant in a warm sunny position and keep moist. 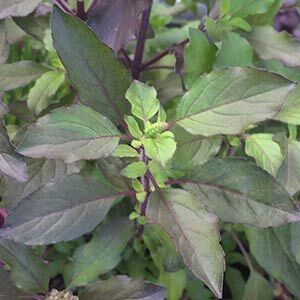 Tulsi Basil grows well in pots and containers and is considered to be a ‘good luck plant’ when planted near a doorway or along an entrance path. One of the issues with Holy Basil is that there are in fact a number of different sub species of Ocimum sanctum. One with green foliage usually referred to as Rama Tulsi (which means White although the foliage is actually green). One with a purplish foliage known as Krishna Tulsi (this means Black and indeed the foliage is a deepish purple) and another that is not really grown commercially. So what is Tulsi used for ? Three purposes, one is medicinal, the second is spiritual the third is for culinary uses. In Ayurvedic medicine it is used for a wide range of conditions. It is grown around temples and homes where it is regarded as a sacred and purifying plant. And finally it is used as a culinary herb in a similar manner to sweet basil.